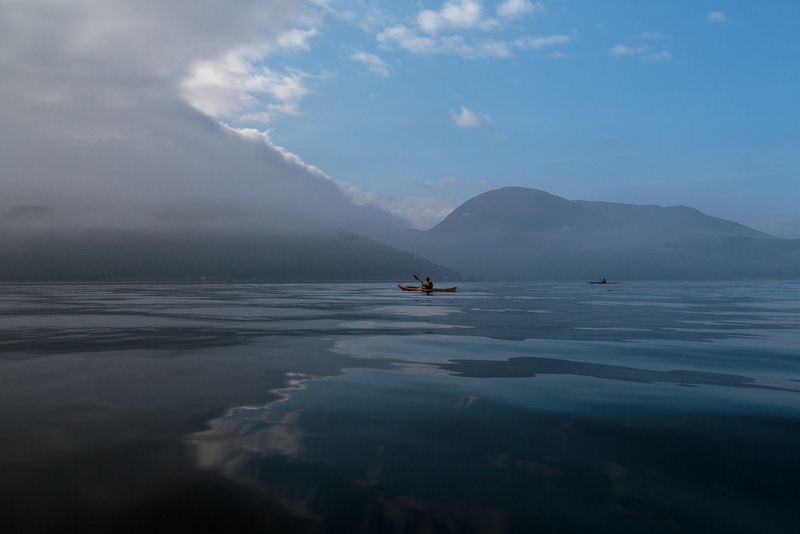 Sea kayaking with seakayakphoto.com: Sea kayaking desktop wallpaper calendar 2015. Sea kayaking desktop wallpaper calendar 2015. Welcome to the 11th annual sea kayaking desktop calendar from seakayakphoto.com! Like 2013, my 2014 has had somewhat restricted paddling. Recovering from several major health problems, caring for my mother in her final illness and then being executor to her estate have all taken their toll on my paddling time. However, what paddling I was able to do was of the finest order and with the best of friends and so quality has made up for quantity. This year all the photos are taken in local waters, all a short drive from home. You can follow the links to Dropbox and download high resolution photos for your computer or tablet desktop wallpaper in either 4x3 or 8x5 format. Leaving Portencross Castle before mid winter dawn. Short winter days in Scotland mean an early start and we often launch and land in the dark. 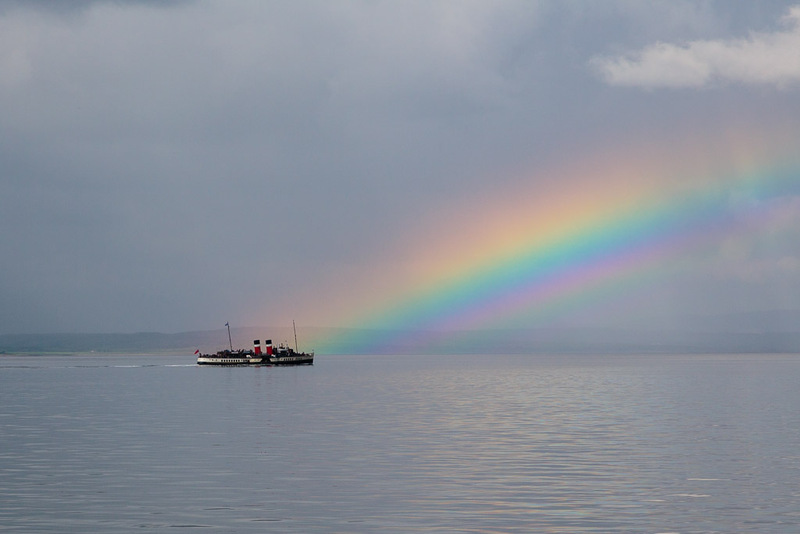 From Portencross, we have set off for the islands of the Firth of Clyde: the Great and Little Cumbraes, Bute, Inchmarnock and Arran. Each is a unique adventure. 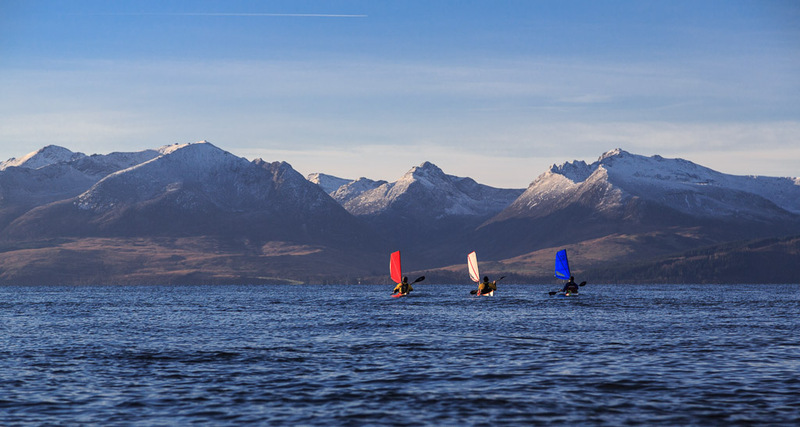 Paddle sailing on a winter crossing to Arran. Our 30km route took us via Garroch Head on Bute then on this fabulous 11 km crossing to Sannox at the north end of Arran. This must be one of the most scenic rossings in Scotland. In winter we arrive in Brodick after sunset then get the ferry back to Ardrossan. 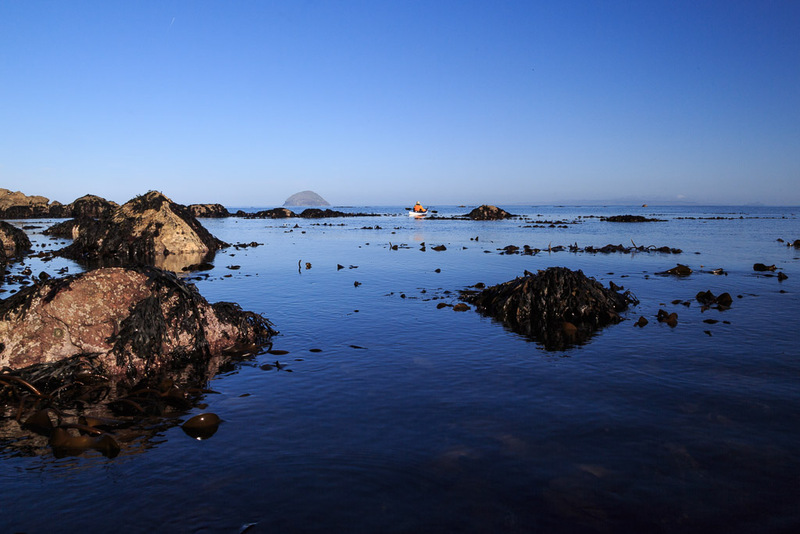 Setting off from the reefs of Lendalfoot on the 14km crossing to the isolated and uninhabited granite island of Ailsa Craig. It lies in an exposed position and the nearest point of land is Lendalfoot. Weather conditions can change rapidly here and we had wind against tide conditions on our return. 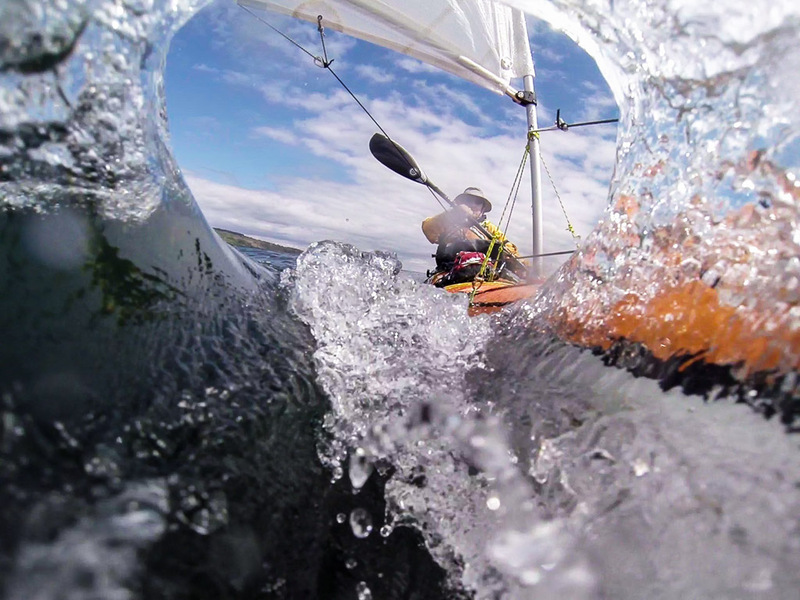 I capsized while paddle sailing across the Bennane Head tide race about a kilometre offshore. Even though it was sunny and I was back paddle sailing in only a few minutes, I was glad I was wearing a dry suit as the water temperature was only 9C. 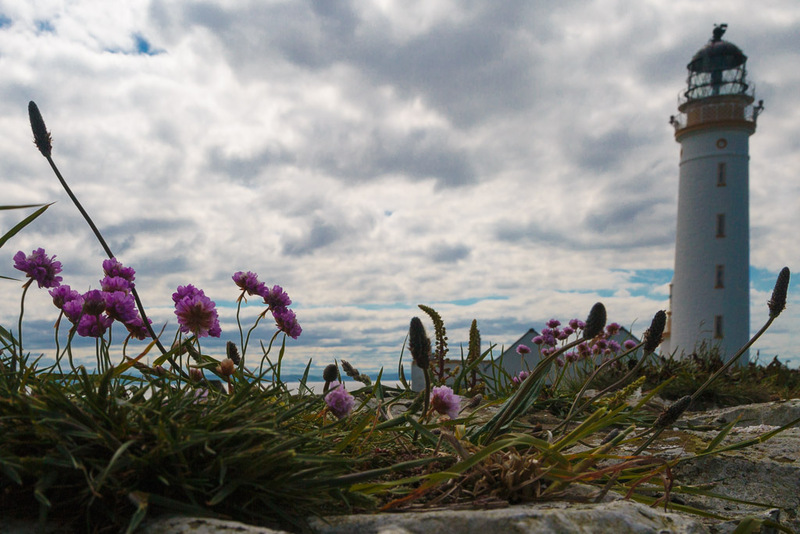 Anyway it did not put me off returning to Ailsa Craig a further two times (three times in all) in 2014. We set off across the Kilbrannan Sound from Kintyre to Arran in thick, gloomy fog. It unexpectedly began to clear when we were about 3/4 of the way across. It was like paddling between a day of two halves. The heather growing on Brown Head on Arran means that it is indeed usually brown. However, in early summer, fresh fronds of bracken add a splash of green. 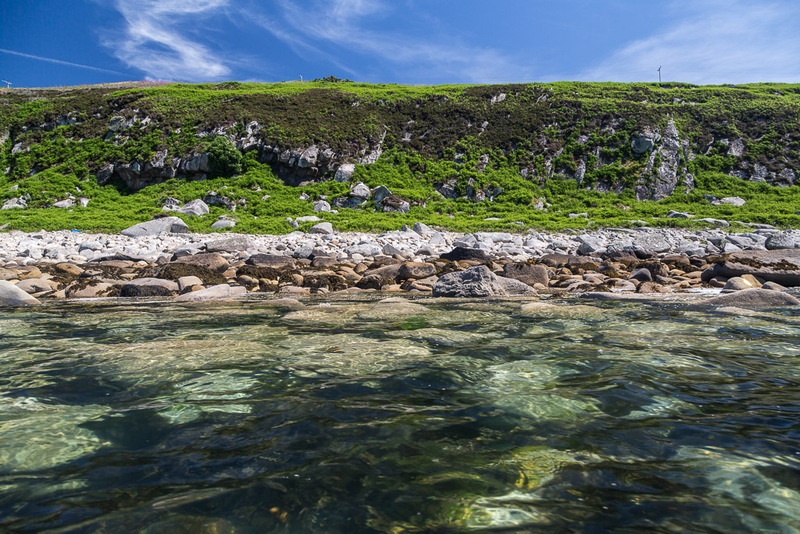 The waters are delightfully clear and on this June day warm enough for swimming in a little bay beyond the head. We passed this way twice this year. Once on a clockwise circumnavigation of Arran in March and once en route from Kintyre to Ailsa Craig in June. Ailsa Craig is a haven for breeding birds the SW and W cliffs soar steeply from the sea and their high ledges are host to tens of thousands of gannets, guillemots, razorbills, kittiwakes and fulmars. Lower down there are colonies of puffins, shags and cormorants. 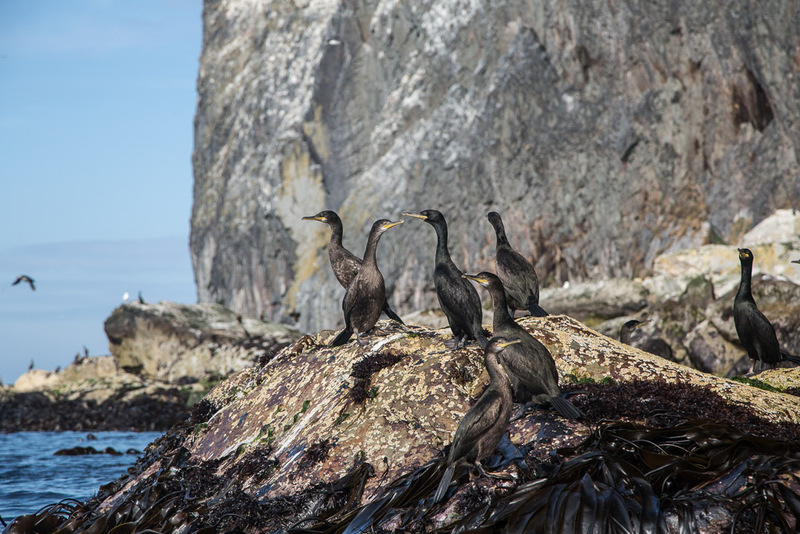 This congregation of cormorants had gathered at Ashydoo Church. No visitor to Ailsa Craig should forget to bring a broad brimmed hat. Cleats Shore on Arran enjoys some fine views like this one to Ailsa Craig, some 23 km to the SE. It is also one of the few naturist beaches in Scotland. There was no one there on our visit so Ailsa got our full and undivided attention. We often see the PS Waveley on our travels. She was built in Glasgow in 1947 for the Craigendorran to Arrochar run but was retired in 1974. Since 1975 she has been operated as a tourist attraction and is now the last sea going paddle steamer in the World. We saw her to the north of Arran in the Sound of Bute in the evening calm that followed a very windy and wet paddle up the Kilbrannan Sound. She is one of our larger fellow paddlers! 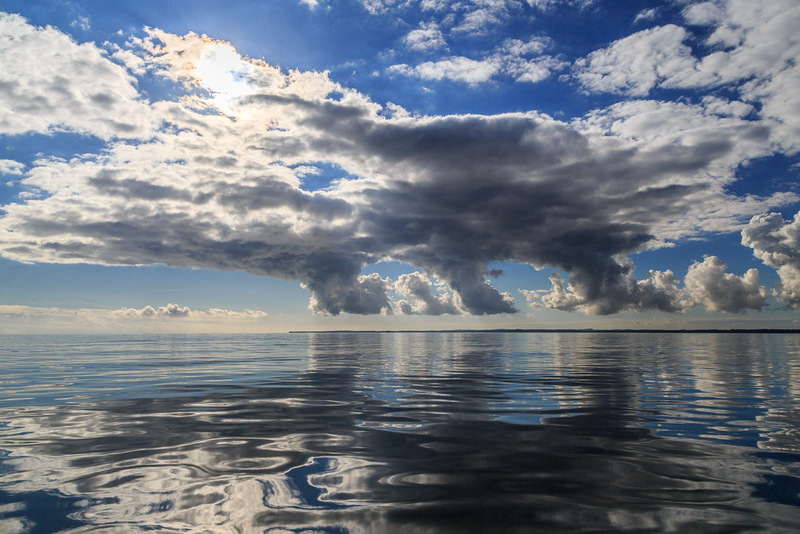 Back in October I paddled out into Wigtown Bay beyond the Islands of Fleet. The wind steadily dropped to nothing but these strange clouds bubbled up from the Machars peninsula and drifted over distant Burrow Head at the mouth of the Bay. Paddle sailing is a whole heap of fun. This is going through the tide race off the south end of Pladda. 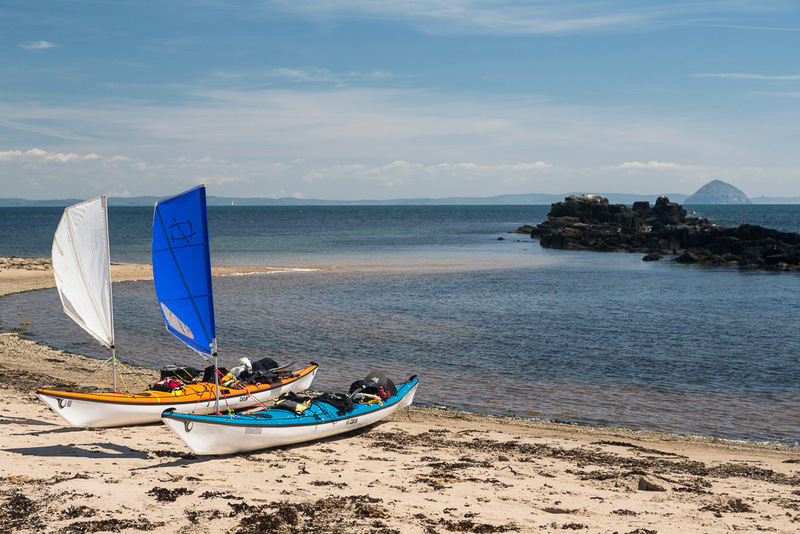 If you only make one sea kayaking resolution in 2015, it should be to give paddle sailing a try! 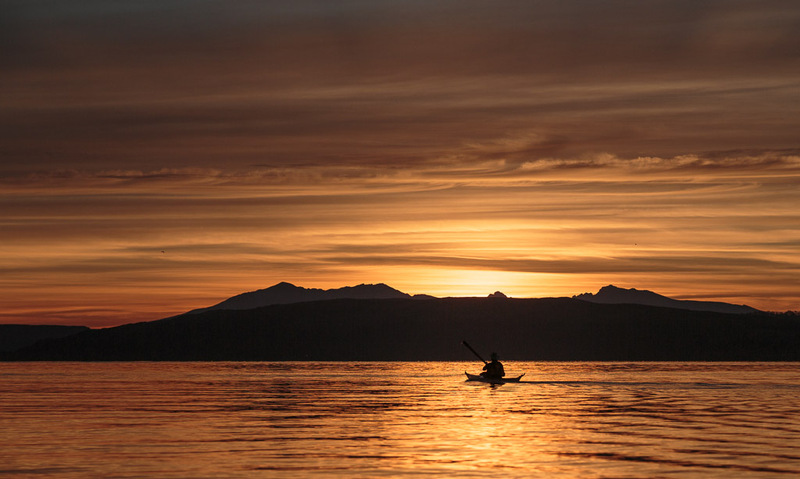 As the winter sun set behind Great Cumbrae and Arran, Duncan Winning and I enjoyed a long chat about kayaking history. At last we went our separate ways as darkness fell. In 1964 Duncan made the first accurate drawings of the kayak Ken Taylor brought to Scotland in 1960 from Illorsuit in West Greenland. This kayak which was made by Emanuele Korniliussen in 1959 is now in the Kelvingrove museum in Glasgow, Scotland. Duncan's drawings were used to create the Anas Acuta, which was a great influence in what was to become the British style of recreational touring sea kayak. I wish all readers of seakayakphoto.com a great paddling year in 2015 and thank you for visiting. Thank you for sharing your great photos and not the least, your words accompanying them! PS! Please check the download link of the November photo. Thank you, link to November 2014 updated! Happy New Year Douglas and thanks once again for the visual treat that is your annual calendar! My favourites are February and December. Regards Rob. Some amazing shots there! Thanks for sharing. Hi Robert, thank you. I appreciate your comments. I have at long last got myself back onto some lower hills so I may be posting some photos from above sea level. The last time I was on a Munro was the 4 tops of Sgurr a' Mhadaidh in June 2004! Thank you for the pictures, Duouglas.I have been looking forward for the 2015 edition! Can I Use number 3 picture as my desktop wallpaper with your permission?